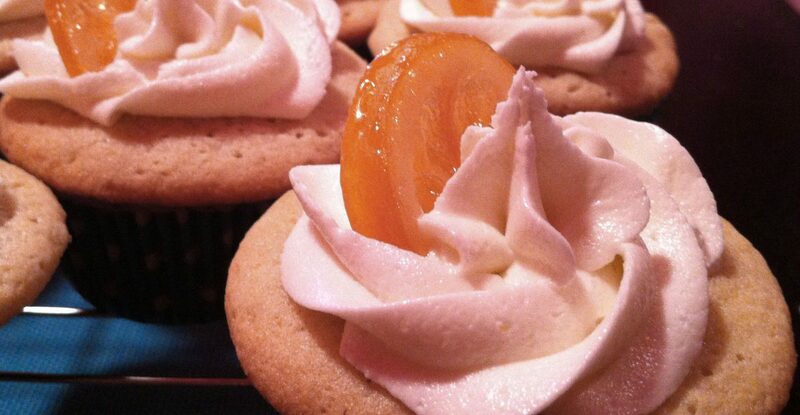 When he heard of my Guinness cupcakes, my friend Trevor joked that I should try Long Island Iced Tea cupcakes next time. Very funny, I thought. But, then, the deal with Long Island Iced Tea is that it tastes like real tea in the end, right? So, why not just use the real deal in my cupcakes? He and his wife conveniently threw a BBQ about the same time. What better for a warm (or cold and rainy, as the case turned out to be) spring day than a batch of iced tea? 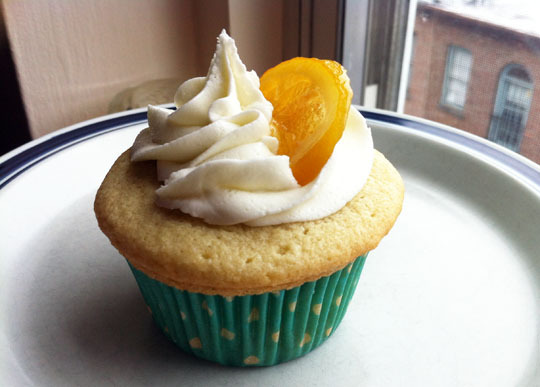 For decoration and a bit of flavor, I added half a slice of candied lemon to each cupcake. I had made them the night before, simmering lemon slices in sugar and water for an hour and leaving them to dry on racks overnight (the Pip & Ebby blog has good instructions, if you’d like to try making these yourself). I think the candied lemons were a nice enhancement, the taste of lemon complementing the tea. “Adult” it may have been, but Miss Sophia (below) seemed to be a fan, too. 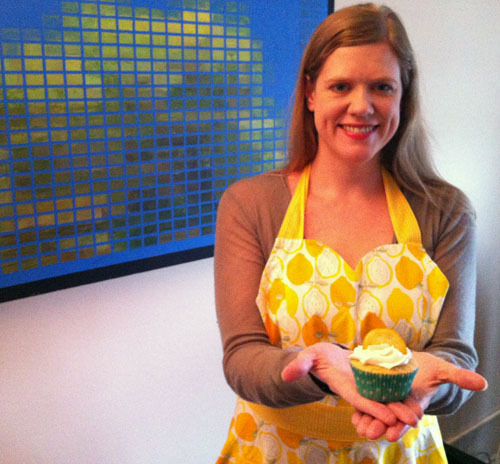 *Stef of the Cupcake Project seems to have thought of everything. 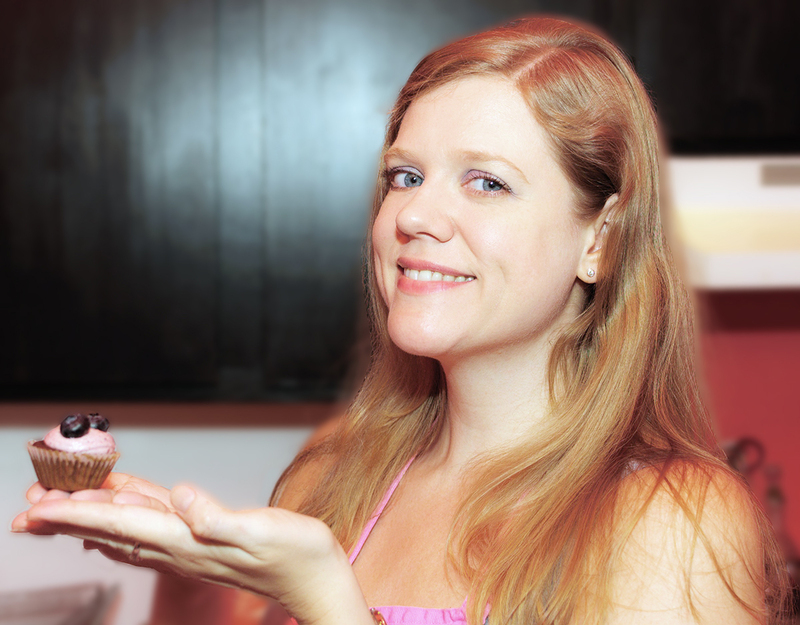 I found her post “How To Get the Flavor of Tea Into Your Baked Goods” when researching the best way to make tea-flavored cupcakes. I did pretty much what Stef suggests to make enough tea-infused butter for the cupcakes and frosting, and it worked like a charm. I kind of want to use this stuff on everything now. 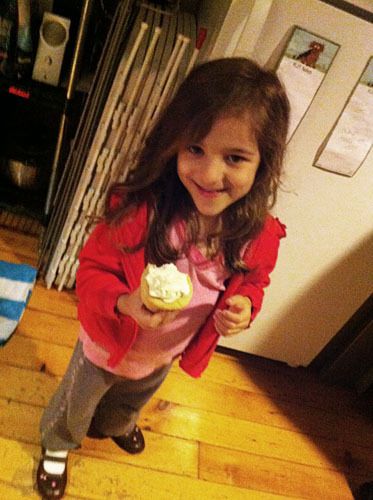 Do check out Cupcake Project for lots of impressive—and successful—cupcake experimentation! Preheat oven to 350°. Place 30 paper baking cups in muffin pans. Cream butter and sugar, add eggs one at a time, mixing until smooth. Sift dry ingredients and slowly add, alternating with almond milk. Mix. Spoon/scoop into tins and bake for 18-20 minutes. Remove from oven, cool in pans 5 minutes, then remove to cool completely on racks before icing. I made buttercream frosting using tea-infused butter in place of about 1/2 the regular unsalted butter. Hi! I tried this recipe yesterday and found my cupcakes to be more muffin-like or maybe more the texture of cornbread. Does melting the butter for the tea and bringing it back to solid before creaming make a difference in the texture of the cake? Does the recipe need more milk? Any suggestions would be helpful! The flavor was delicious and they were light, which we liked. I don’t like dense cakes. Melting the butter and bringing it back to solid should not make any difference. It’s been a few years since I made this recipe, so I don’t remember the texture exactly. Were they dry? I often use sour cream or yogurt in my recipes now, which makes them more moist in general. If you have a favorite vanilla cupcake recipe, you might try that, leaving out the vanilla and substituting the tea butter for regular butter in the recipe. I might have to bake these again, to see how they turn out and if I can improve the recipe, if needed!